MGHD students at work with Gardens for Health International. Left: Marcella Canelo. Photo her own. Right: Dr. Angeline Mumararungu. Photo by Zacharias Abubeker for UGHE. Dr. Kurt Figueroa (right) and Nurse Sebishyimbo François (left) see patients for their oncology consultations at Butaro District Hospital in Rwanda. Photo by Zacharias Abubeker for UGHE. 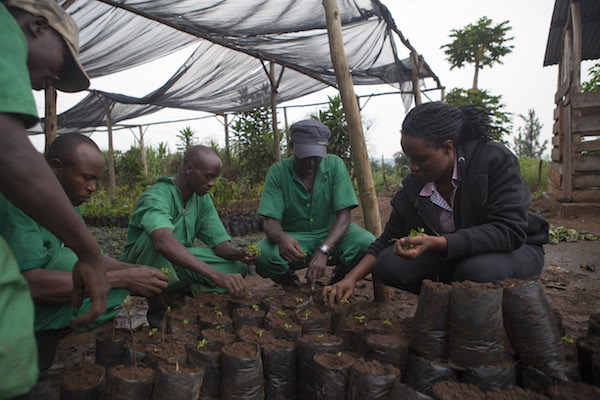 Caroline Numuhire, a student in the MGHD Class of 2017, works with rural farmers in Rwanda. Photo by Zacharias Abubeker for UGHE. Dr. Eugene Tuyishime (left), a student in the MGHD Class of 2017, participates in a group discussion. Photo by Zacharias Abubeker for UGHE.